Hello everyone, sorry it's been a while, I've been super busy and now I want to catch you up on what I've been up to! We just finished celebrating Purim. While in the United States people believe that a carnival and a creative shpiel suffice as a Purim celebration, the Israelis beg to differ. Basically the whole month that Purim is in includes celebrations and other fun activities. We began by playing assassin and even though we began the game about 3 weeks ago, it just ended a couple of days ago. It's a really fun game that everyone can get involved in. We also kicked off a round of mystery Moses (the Jewish version of “Secret Santa”). We secretly gave gifts to our designated person for the week before Purim week, and then we tell them who we are the day before. Also, we did a spirit week in the week leading up to Purim. Some of the things we had to dress up as were mismatched Monday and twin day. This was so much fun! Now, for the actual beginning of Purim, we began with our own party and shpiel on the kibbutz. Everyone was dressed up in the costume of their choice. 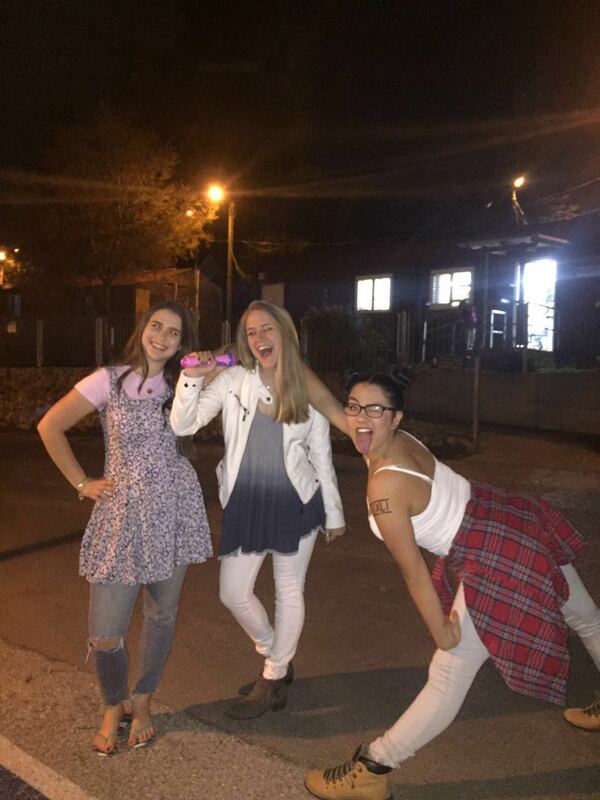 It really felt like Halloween, for example, our counselors were the characters from Inside Out and me and 3 other friends were Miley Cyrus (the old one, I was this one), Hannah Montana, and Miley Cyrus (the new one). This was so much fun and we even won the costume contest (check out the picture!). The next day, we went to Tel Aviv. We walked around for a while and it was just so interesting to see everyone dressed up as something different. Some people were very simple and just wore a funny hat and other pretended they were the characters from “Avatar” and painted their whole body blue. So Purim was technically over the night we got back from Tel Aviv; however, the celebration and commemorations still continued. Friday morning we went into the old city and stood with the organization Women of the Wall, led by Anat Hoffman, as they read from the Megillah. The men on the other side of the wall did not seem as phased by this, but some of the more traditional women attempted to get us to stop, however their efforts had no effect on us. As I write this we are packing our bags in preparation to leave for Poland. It’s hard to describe my feelings, but, the best way I can put it is that I am looking forward to becoming more educated about the holocaust and have the ability to honor those who perished in it. Hello everyone, I missed you! Sorry I haven't blogged in a while I just got rescued from a juvenile detention center in Siberia. It was hard, but educational, just like my time in Gadna. So if you aren't aware Gadna is a week long taste of the Israeli army, which many Israeli teens experience to prepare them for the army. While many people use Gadna to release enough tears to fill an entire ocean, I had an amazing experience. I had so much fun messing with my commander and trying to make her laugh when she tried to be super serious in front of us. However, I succeeded in making her laugh and smile on several occasions. Also, just a little tip if you plan on going to the IDF, they do not enjoy it when you march behind them or salute them. 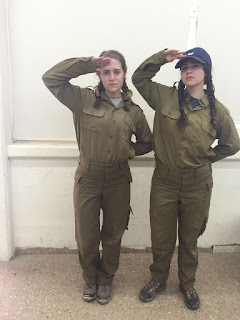 Some of the highlights of my Gadna experience include, painting my face with mud, engineering the construction of my tent, cleaning the dining room and kitchen for 5 hours (well kind of), braiding the Israeli girls hair, and trying to make friends with my commander (and failing :-( ) . I loved braiding the Israeli girls' hair, failing to make friends with my commander, cleaning the dining room and kitchen for the first 15 minutes, then I proceeded to lead my group in many musical performances including (but not limited to) High School Musical, Camp Rock, and Annie. But above all I just enjoyed living the life of the IDF soldiers. Just like in regular life, not everything in army life is perfect. Shooting a gun was not fun, it made me sad. Also, sleeping in a tent while the big bad wolf is trying to blow your tent down is not ideal, I got over it and had an overall fantastic time during Gadna.